The owner of this T210 suggested making some baffle modifications to improve cooling of cylinders #5 and #6 by “giving them more air.” This would NOT have been a good idea, and would almost certainly have made things worse instead of better. I recently had my engine rebuilt and had a new baffle kit installed. The CHTs for cylinders #5 and #6 are always 20ºF to 30ºF hotter than the rest. During climb the difference gets even bigger. Cylinder #5 and #6 CHTs are very difficult to keep below 400ºF during a climb, even with the cowl flaps open and rich mixture. Should I consider giving them some air? On cylinder #6, why not cut one or more holes in the white aluminum baffle in front of the cylinder? 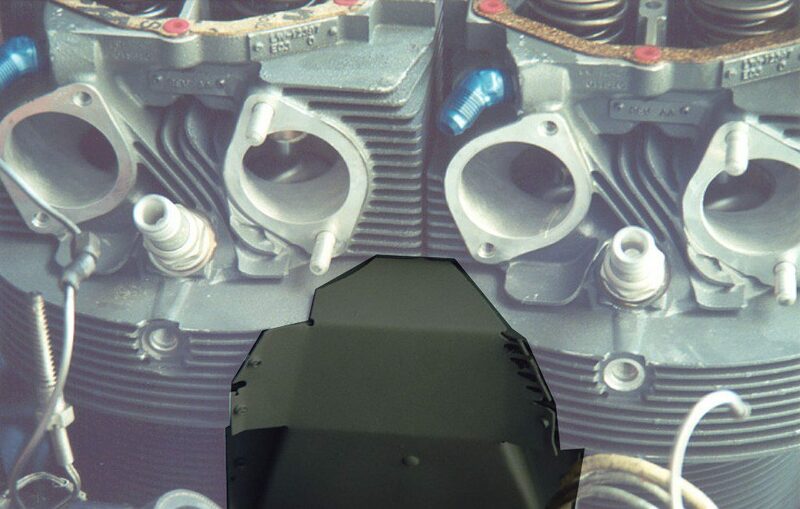 On cylinder #5, why not drill one or more holes in the horizontal aluminum plate located behind the oil cooler? I replied that cutting holes in the baffles was definitely NOT a good idea, and that doing so would undoubtedly make the cooling problems worse, not better. 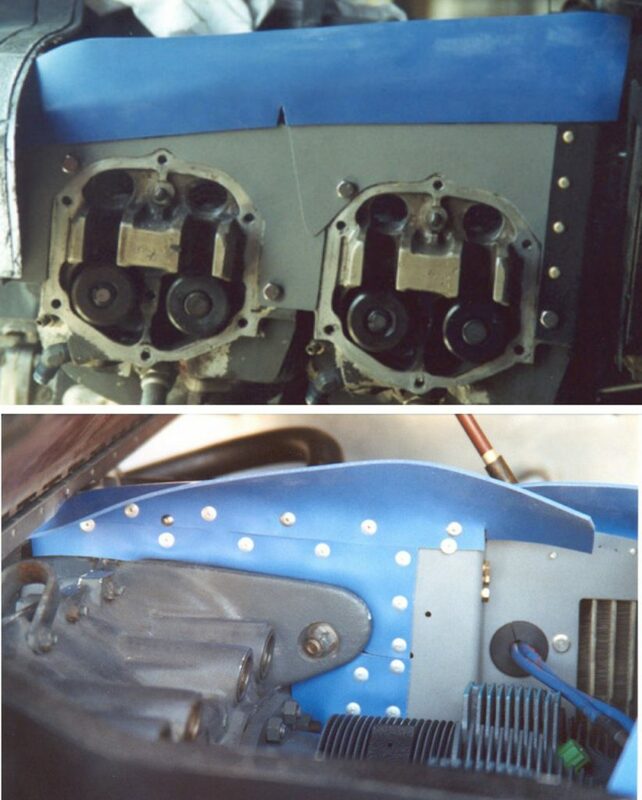 It was apparent that the T210 owner didn’t understand how the powerplant cooling system in his aircraft works, or what the function of the baffles is. He’s not alone—some A&P mechanics don’t fully understand it, either! Early aircraft engines were ‘velocity cooled’ by passing the slipstream over the finned cylinders. However, this simple approach to cooling is simply not practical for today’s high-performance engines and low-drag airframes. In the early days of aviation, aircraft designers took a simple approach to the problem of cooling aircraft engines. 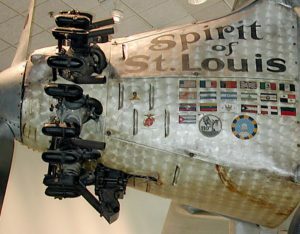 The engines were mounted with their finned cylinders out in the slipstream and cooled by the horizontal flow of ram air. This design is known as “velocity cooling” and was adequate for cooling the low-compression single-row radial engines of the time. As engines grew more powerful and multi-row radials and horizontally opposed engines went into service, it became obvious that simple velocity cooling wasn’t up to the job. For one thing, cooling was uneven—front cylinders got a lot more cooling airflow than rear cylinders. For another, sticking all those cylinders out in the breeze created horrendous cooling drag. A better scheme was obviously needed. That better system was known as “pressure cooling” and is the method used in all modern piston aircraft. Pressure cooling is accomplished by placing a cowling around the engine and using a system of rigid baffles and flexible baffle seals to produce the volume and pattern of cooling airflow necessary to achieve even cooling with minimum drag. The heart of a modern ‘pressure-cooled’ powerplant installation is a set of rigid sheet-metal baffles and flexible baffle seals that, together with the engine cowling, divide the engine compartment into two chambers: a high-pressure area above the engine and a low-pressure area below and behind the engine. Engine cooling depends upon the vertical airflow from the upper chamber to the lower one. Cowl flaps modulate the cooling by regulating the vacuum in the low-pressure chamber. Our modern piston aircraft are powered by tightly cowled horizontally opposed engines. Inside the cowling, a system of rigid aluminum baffles and flexible baffle seals divide the engine compartment into two chambers: a high-pressure area above the cylinders, and a low-pressure area below the cylinders and behind the engine. 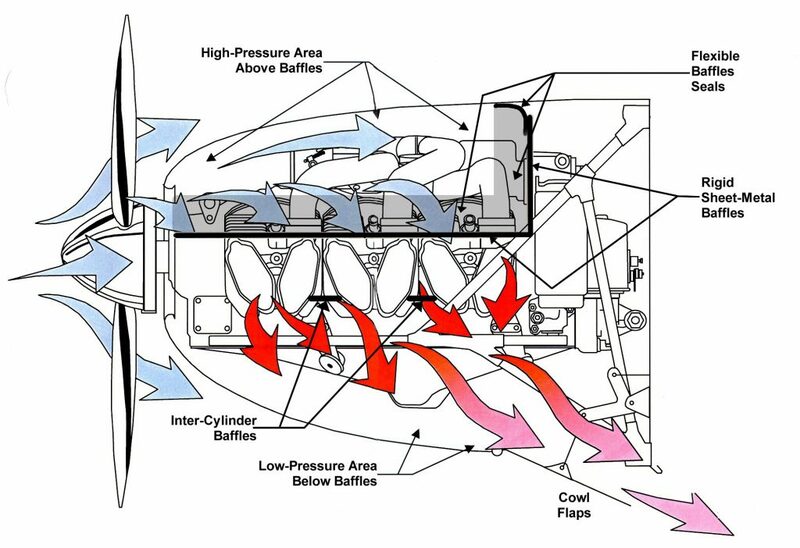 Cylinders are cooled by the vertical flow of air from the high-pressure above the engine to the low-pressure below it. Cooling airflow is top-to-bottom, not front-to-back. It’s important to understand that the pressure differential between the upper and lower chambers is remarkably small: A typical high-performance piston aircraft generally relies on a delta-P of just 6 or 7 inches of water—about 1/4 PSI! Aircraft designers try to keep this delta-P to an absolute minimum, because higher delta-P means higher cooling drag. …and so what if they don’t? Flexible seals are used to prevent air from escaping through the gaps between the engine-mounted sheet-metal baffles and the cowling. To do their job, they must be oriented so as to curve toward the high-pressure chamber above the engine, so that air pressure pushes them tightly against the cowling. Probably the most trouble-prone part of the cooling system is the system of flexible baffle seals. These flexible strips (usually high-temp silicone rubber) are used to seal up the gaps between the sheet metal baffles and the cowling. These gaps are necessary because the baffles move around inside the cowling as the engine rocks on its shock mounts. To do their job, the seals must curve up and forward into the high-pressure chamber, so that the air pressure differential (delta-P) presses the seals tightly against the cowling. If the seals are permitted to curve away from the high-pressure area—not hard to do when closing up the cowling if you’re not paying close attention—they can blow away from the cowling in-flight and permit large amounts of air to escape without doing any cooling. I recall some years ago inspecting a Cessna TR182 whose pilots had complained of high CHTs. Upon removing the top engine cowling, I immediately spotted the problem: One of the ignition leads was misrouted and became trapped between the baffle seal and the cowling, preventing the baffle seal from sealing against the cowling. 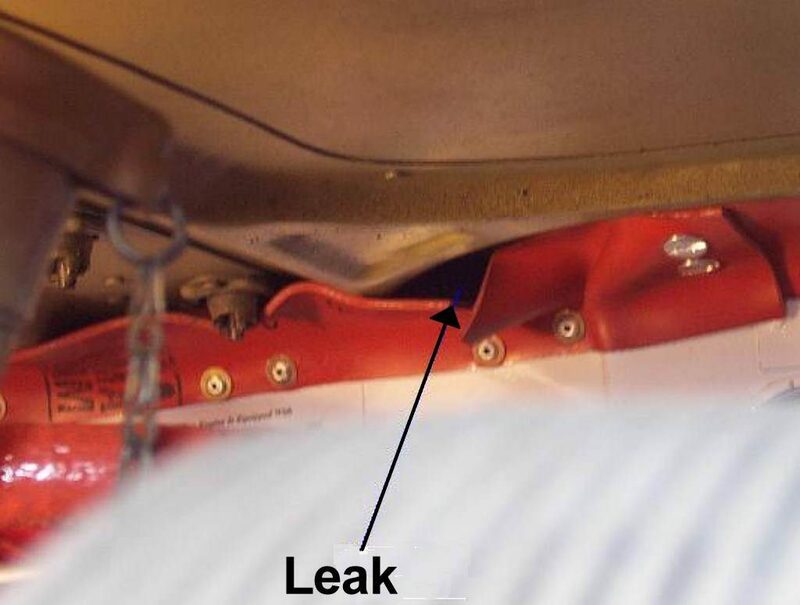 The ignition lead had become severely chafed where it rubbed against the cowling, and an A&P had wrapped the chafed area with electrical tape, but failed to reroute the tape-wrapped lead to keep it away from the baffle seal. Clearly that A&P didn’t understand the importance of an air-tight seal between the baffle seals and the cowling. Repositioning the ignition lead solved both the cooling problem and the chafing problem. Yet another trouble-prone part of the cooling system is the inter-cylinder baffles. These are small, oddly-shaped pieces of sheet metal mounted below and between the cylinders. Their purpose is to force the down-flowing cooling air to wrap around and cool the bottom of the cylinders, rather than just cooling the top and sides. These baffles are difficult to see unless you know exactly where to look for them, but they are absolutely critical for proper cooling. It’s not at all uncommon for them either to be left out during engine installation or to fall out during engine operation. Either way, the result is major cooling problems. Awhile back, I noticed that the #3 cylinder of the right engine on my Cessna 310 was running noticeably hotter than its neighbors. I removed the top cowling from the right engine nacelle and carefully inspected all the aluminum baffles and rubber baffle seals, but couldn’t find anything awry. Frustrated, I removed the lower cowlings so that I could inspect the underside of the engine. Sure enough, I discovered that the intercylinder baffle between cylinders #1 and #3 had vibrated loose and shifted about 1/4 inch out of position, creating a significant air leak near the #3 cylinder. Repositioning the baffle properly and tightening its attach bolt to hold it securely in place against the cylinders and crankcase solved the problem.